How free do you feel? It’s not always a straightforward thing to answer. We can become bound by what seems safe and familiar, little realising how much such things can choke the joy within, suffocate with their similarity. What we fear could actually be a pathway to freedom, a way toward expansive living we have yet to experience. It’s not always easy to discern what has drawn parameters around our days, hedged us in by happenstance. Those of us with chronic illness are aware of its limitations, ones we often chafe against. The life we once knew gets swallowed up in a painful new familiar, a pattern not of our choosing, as it does for all who are captive to sickness, to various addictions, trapped by a painful past, or stuck in a stultifying situation in the present. And the prison we are in can feel safer than the prospect of freedom, even as we ache for release. We’ve considered how joy sits companionably with sorrow and grief; it also accompanies us like a gentle spur inspiring challenge and change. Sometimes all it takes is a holy nudge of remembrance, an opening of eyes to the truth that already exists. We think of Jesus, who for the joy set before Him endured the cross, shame and pain. What was the joy that kept Him captive to the cross? It was the knowledge of bringing us back to the Father as blood-bought, adopted sons and daughters. It wasn’t intended only as a hope for heaven but as a lifelong, eternal relationship transforming and greatly impacting our time on earth, a way to live freely despite difficulties, because God walks with, strengthens and equips us for everything. Jesus broke out of the confines of the tomb, slipped off restrictive bandage-bindings and walked free, gloriously raised to newness of life. It was a statement of intent to the world and a visual reminder of the way renewed life springs from what was dead. He offers us the same invitation to joy and freedom. We get a foretaste of joy here and a feast in heaven to come. Freedom can seem scary, or an impossible dream, but with God initiating and holding us as we take brave faith steps it becomes a liberating reality. Because freedom and release are not necessarily gained by losing our chains. What frees and gives joy is a change of attitude, a renewed mindset that sets us free to live differently. Our days may look the same to outside eyes but we are living with a fresh heavenly perspective rather than a worldly, earthbound mindset. Joy is not only possible in the midst of challenge and pain, it’s freely available, always. Once we become aware how much our heart attitude shapes our thoughts, we can begin to embrace joy and discover freedom in less than joyful circumstances. You don’t have to wait for a new year to arrive before your flight to freedom begins. You can make a fresh start Now, Today, This Moment. God’s mercy and forgiveness are available 24/7. 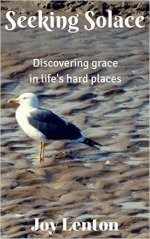 Spread your wings and ride in God’s continual current of grace, His loving, freeing embrace. Welcome to #day18 of #write31days of journeying into joy. My hope and prayer is that you are being helped and encouraged as we undertake this journey together. Bless you for being here. Dear Joy, Oh how true I find this: “Once we become aware how much our heart attitude shapes our thoughts, we can begin to embrace joy and discover freedom in less than joyful circumstances.” Yet, even though I know this to be the way, I see myself (emotionally) standing in the corner and pouting about my circumstances all too often! Thank you for these words this morning–this is one time that I am glad for the time difference between our locations–I am so blessed by your words coming early to start my day. The precious Freedom is waiting right here, as I relinquish my hold on that pouting mindset, and look to Jesus as my example to embrace HIS joy! –Hugs and Blessings my friend! “What frees and gives joy is a change of attitude, a renewed mindset that sets us free to live differently.” So many times all I need is a change of attitude to lift my spirits and bring freedom and joy. I’m really enjoying your series, because it helps me remember to look for the joy. I’d probably be joining you and Bettie in the corner more times than I’d like to admit. But there is plenty of grace for us all, right? Joy, I love your poem! I’ve said it before and I’ll say it again – I really believe we are kindred spirits! A holy nudge of remembrance… thank you, Joy! I’m glad these lines resonated with you, Tara. It’s a joy to think of freedom being available to us because of Christ’s finished work on the cross and His glorious resurrection from the tomb. May you rest in that truth. my friend. Yes, abundant grace! Thank you for being His light. Thank you Joy for your warm welcome! I will make myself at home in the archives. Such goodness and blessings! Bless you, Gena! I aim to reveal something of God’s goodness and grace as I offer hope and encouragement in this space. In reflecting on joy this month and writing far more frequently than usual, I am being made aware of God’s goodness more than before. He not only inspires my thoughts, He also enables and sustains me to write. A grace gift I don’t take for granted! Joy, How the Lord has blessed us with the gift of your writing-such love and encouragement! So thankful to have found you! May God bless and inspire you as you share your gift and feel the warmth of His smile as He delights in you!